Jen Usellis is a proud Chicago girl with 8 years of living in the Twin Cities possibly influencing her dialect. Jen earned a B.F.A. in theatre from Millikin University. 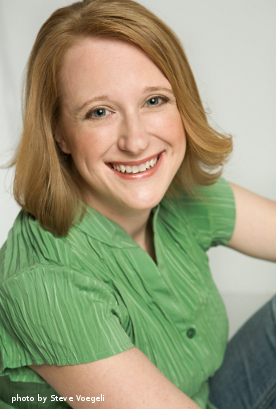 She studied audition technique with Jane Brody, classical voice with Sandra Jozef, short-form improv with ComedySportz-Twin Cities, and completed the improv training program at iO Chicago. Jen's theatre credits include performing with In The Basement Productions in My Thing of Love as Elly, the St. Patrick Summer Theatre's production of Picnic as Rosemary Sydney, and the Chicago premiers of Commedia Beauregard's productions of A Klingon Christmas Carol and Bard Fiction. It was Jen's work with A Klingon Christmas Carol that brought her into the path of Improvised Star Trek and "HIchop." Jen has been described as a "powerhouse vocalist". Her ability to "embody the attitude and spirt of whatever she is singing" has made her a crowd favorite with all of her projects. Jen recorded CD's with The Express Band and Prior Bros Band in Minneapolis. In Chicago, she has sung lead vocals with No Big Deal, Sorry Charley and The Tunas, Seven Soul and recorded with Our Hill of Beans. Jenhas performed on some of Chicago's finest stages including the Hard Rock Cafe, Abbey Pub, Cubby Bear, and Wire. Jen's newest project, The Klingon Pop Warrior, combines her love of singing, acting and geeking out into one wild ride! Check out the music on Amazon, iTunes, GooglePlay or CDBaby and request The Klingon Pop Warrior at your local convention!